This is the second of a series of 10 quizzes on the 10 countries joining the EU on 1 May. The Czech Republic is one of the largest of the new member states, in terms of population, and one of the closest to western Europe - Vienna is actually further east than Prague. How much do you know about the country? Test yourself with this interactive quiz. Which of the following was Czech? Martina Navratilova and Ivan Lendl are two of best known Czech tennis stars. Which of the following players is Czech? Which of the following was not born on the territory of today’s Czech Republic? The science-fiction writers Josef and Karel Capek invented which of the following in their 1921 play, RUR? A Czech or Czechoslovak team has won the ice hockey world cup nine times since 1947. In which of the following years was the Czech team not world champion? What did the Czech professor Otto Wichterle (1913-1998) invent? 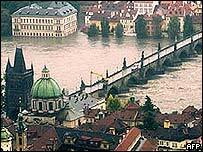 Which Czech town is sometimes described as the home of lager? What is the Magic Lantern? Which of the following Oscar winners was not born on the territory of today’s Czech Republic? The town of Kutna Hora produced a silver coin that was used as a form of hard currency throughout Central Europe between the 14th and 19th centuries. What was it called? Low score? Visit Inside Europeto brush up your knowledge. Or if you're in the UK, challenge your knowledge gap at the Meet the Neighbours festival at the Foreign and Commonwealth Office on 24 April. Go to www.europe.gov.uk for details.